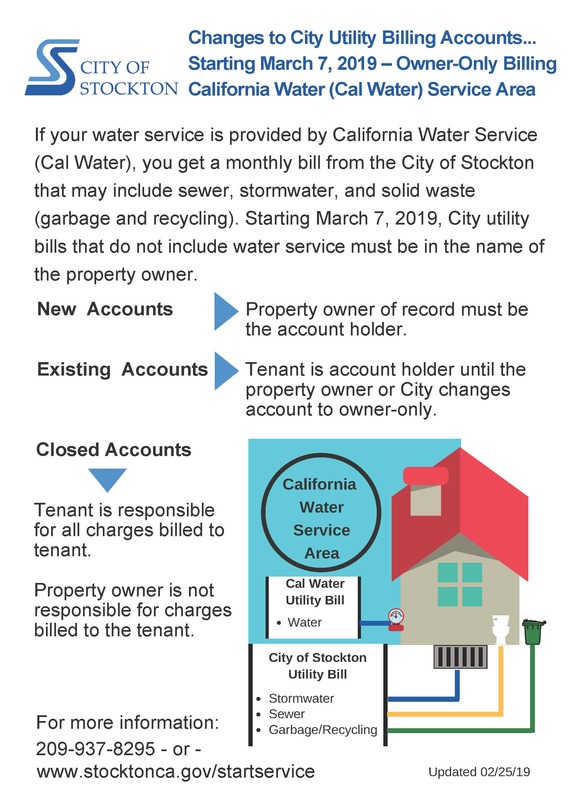 Subscribe to the City of Stockton News Releases to receive emails with current City happenings. You can also subscribe to other topics, including events and volunteer opportunities. Thursday, April 25, 2019, 6 p.m., Arnold Rue Community Center, 5758 Lorraine Ave.
Thursday, May 2, 2019, 6 p.m., Stribley Community Center, 1760 E. Sonora St.
Tuesday, March 26, 2019, 9 - 11 a.m., Civic Auditorium, 525 N. Center St. Deadline for submittal is Monday, March 11, 2019, at 8 a.m. Application period opens March 4, 2019, and ends, March 28, 2019, at 4:30 p.m.
Visit www.stocktonca.gov/hirestockton for guidelines and application. Tuesday, Jan. 15, 2019, 5:30 p.m., Stockton Memorial Civic Auditorium, 525 N. Center St.
Saturday, Jan. 12, 2019, 1:30 - 3:30 p.m., Van Buskirk Community Center, 734 Houston Ave. Applications due Thursday, January 31, 2019, by 4 p.m.
Friday, Nov. 30, 2018, 8:30 - 10 a.m., Stribley Community Center, 1760 E. Sonora St. Both design sessions offered on Saturday, December 8, 2018. Arnold Rue Community Center, 5758 Lorraine Ave., 1 – 2:30 p.m.
Margaret Troke Library, 502 W. Benjamin Holt Drive, 3:30 – 5 p.m.
Weber Point Events Center gates open at 4 p.m.
Lynn Hahn Memorial Delta Reflections Lighted Boat Parade at 6 p.m. Learn more about meetings on October 17, 18 and 19 at www.stocktonca.gov/cannabis. Sunday, Oct. 21, 2018, 4 - 9 p.m., Weber Point Events Center, 221 N. Center St.
Free and open to the public with entertainment, interactive exhibits, food vendors and Stockton’s first-ever drone light show. Tuesday, Oct. 2, 2018, from 5:30 - 7:30 p.m.
Saturday, Oct. 6, 2018, from 11 a.m. to 1 p.m.
Tuesday, Oct. 16, 2018, from 5:30 - 7:30 p.m.
Tuesday, Aug. 7, 5-8 p.m. 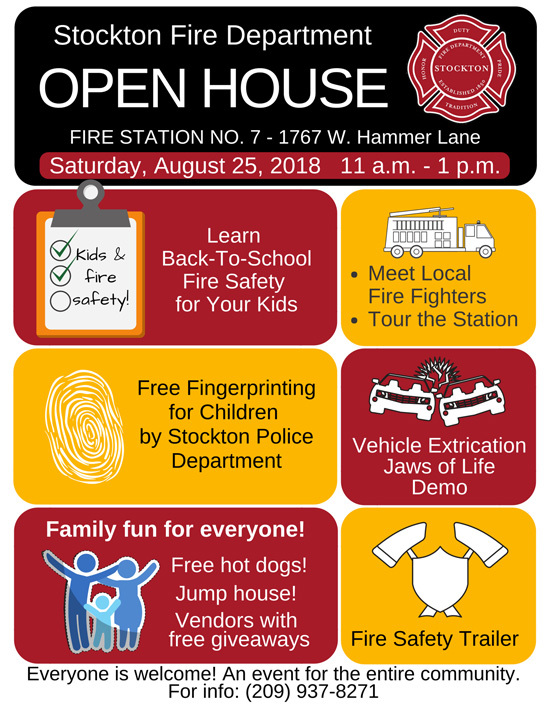 Learn more at www.stocktonca.gov/nno. 5:30-7:30 p.m., Cesar Chavez Central Library, 605 N. El Dorado St.
5:30 p.m., City Hall, Council Chamber, 425 N. El Dorado St.
Tuesday, June 26, 9 a.m. to 2 p.m.
Robert Cabral Agricultural Center, 2101 E. Earhart Ave.
Saturday, June 16, 11 a.m. to 1 p.m.
Thursday, May 17, Street Closures10:50 a.m. to 12:30 p.m., Race Start at 11:20 a.m.
Other Tour Festivities Begin as Early as 9 a.m.
Monday, April 30, 6 - 7 p.m.
Thomas Alva Edison High School, Cafeteria/Multipurpose Room, 100 W. MLK Jr. Blvd. Saturday, April 21, 10 a.m. to 11 p.m.
Saturday, April 21, 11 a.m. to 1 p.m.
Fire Station No. 12, 4010 E. Main St. Application period for Fireworks Sales Permit Lottery opens March 1, 2018, and ends March 29, 2018, at 4:30 p.m. Applications due Friday, April 6, 2018, by 5 p.m. Opens Tuesday, February 13, 2018, 7:30 a.m. and closes Friday, March 9, 2018, 5 p.m. Nomination packets due no later than Thursday, February 8, 2018, by 4 p.m.
Monday, January 29, 6 - 7:30 p.m.
Tuesday, January 9, 5:30 p.m.
Marina West Yacht Club Delta Reflections Lighted Boat Parade at 6 p.m.
Tuesday, October 17, 2017: 5:30 – 7 p.m. Applications due Friday, August 11, 2017, by 5 p.m.
Thursday, July 20: 9 - 11 a.m., Civic Auditorium, 525 N. Center St.
Fireworks: Gates open at Weber Point at 5:30 p.m., fireworks to start around 9:30 p.m. Applications due Friday, July 14, 2017, by 5 p.m.
First movie "The Secret Life of Pets" on Friday, June 9; gates open at 6:30 p.m.
Wednesday, May 17: 3:30 p.m., Eden Park, 924 N. El Dorado St.
Saturday, June 3: 10 a.m. to 4 p.m., McKinley Park Community Center, 424 E. 9th St.
Grand Re-Opening celebration Wednesday, May 10, 2017, 3 - 6 p.m., 2370 E. Main St.